It's that time of the week again....erev Shabbat and thank G-d because I dont think I could be more tired even if I tried. Yesterday had me up at six am for a bris in Jerusalem. I think I was in bed at ten thirty pm. See? I knew turning twenty three was the beginning of old ;) In any case, I'm ready for the weekend. Anyway.... The event was nice and a great opportunity to see and meet a lot of the family that I have here in Israel but have never been introduced to. And burning dumpsters. At eight in the morning. Go figure. Ok, back to baking. This Potato Pizza is Jim Lahey's (of no knead fame) recipe that is featured in Maggie Glezer's awesome Artisan Baking Across America. It is also the second recipe that I made for the break fast this week. I must say that even though I myself personally didn't try it, I am so excited about it. Why? Well, look how beautifully it turned out. It's quite the looker, isnt it? 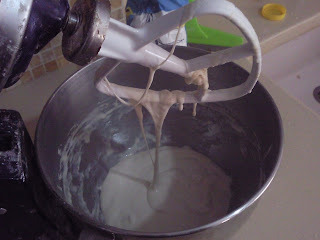 But more so than that because it was a really fun dough to work with and it turned out perfectly. 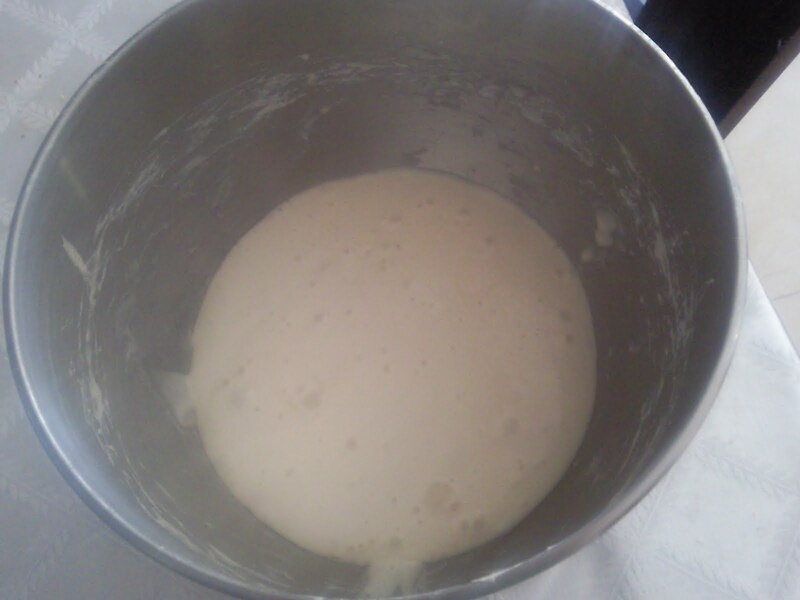 The dough is more of a batter that is beaten into submission for twenty minutes (much like Rose's focaccia which I want to tackle too) in a mixer (LOVE KITCHEN AIDs!!) 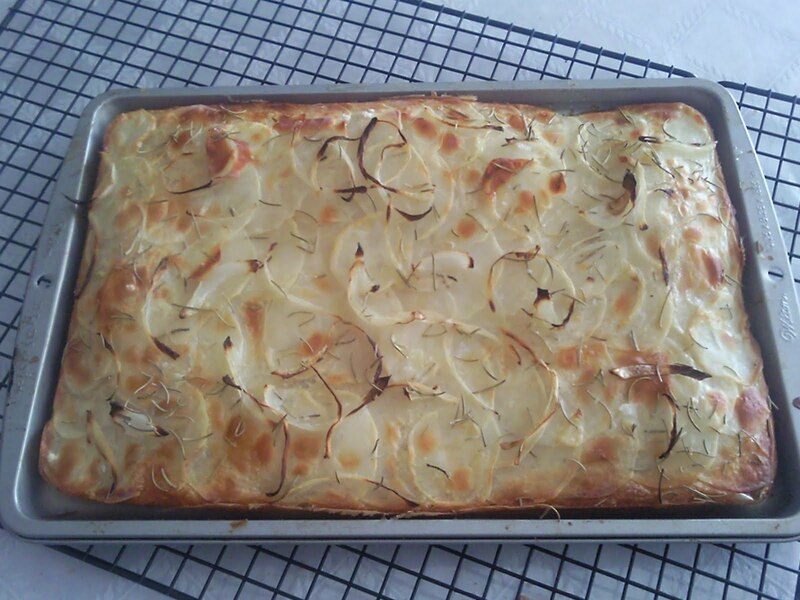 to form its gluten and then allowed to ferment for four hours before being poured into a pan allowed to rise again and topped with thinly sliced potatoes (I HEART mandolines!) 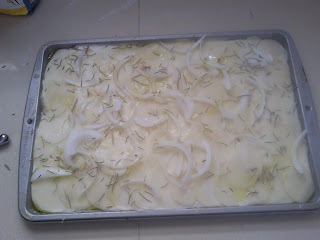 onions and rosemary. The result was the crispiest pizza bottom, I know because you could just tell! and a lovely interior structure. And my friends loved it, too. I made it in one rectangular pan and it was more than enough. It was difficult to get it to spread all the way to the corners but I did my best and it turned out fine. 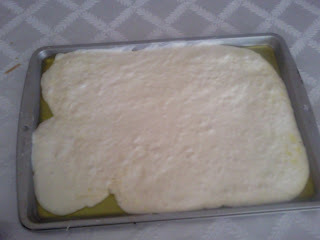 Making two pizzas out of it would have just made my life more difficult than actually necessary. Don't forget lots of salt and a salad to serve on the side. Here's to the weekend! Oh and check out Yeastspotting! 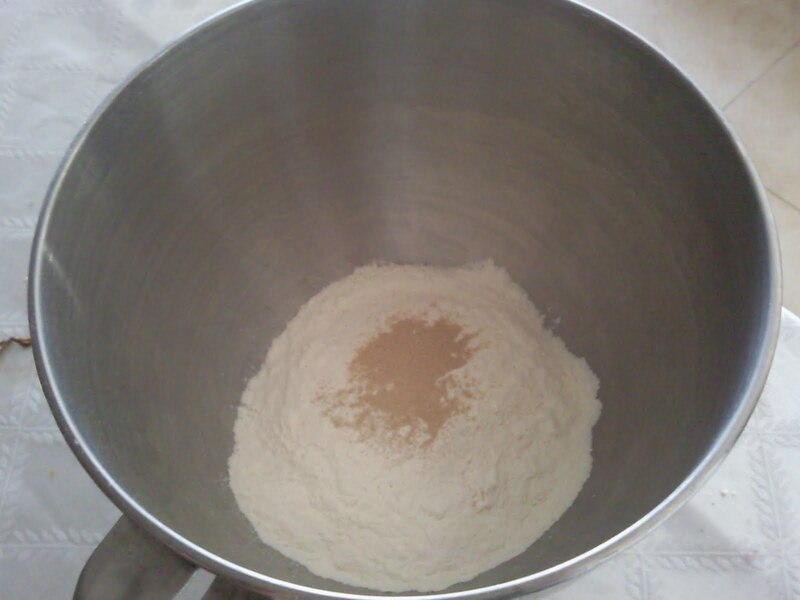 Place the flour and yeast in the mixer bowl. 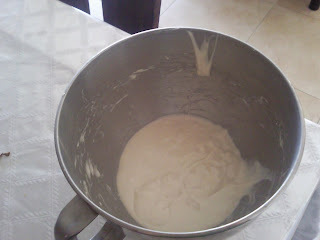 Using the paddle beater, mix for a few minutes until evenly combined. With the mixer running on low speed, add the water. 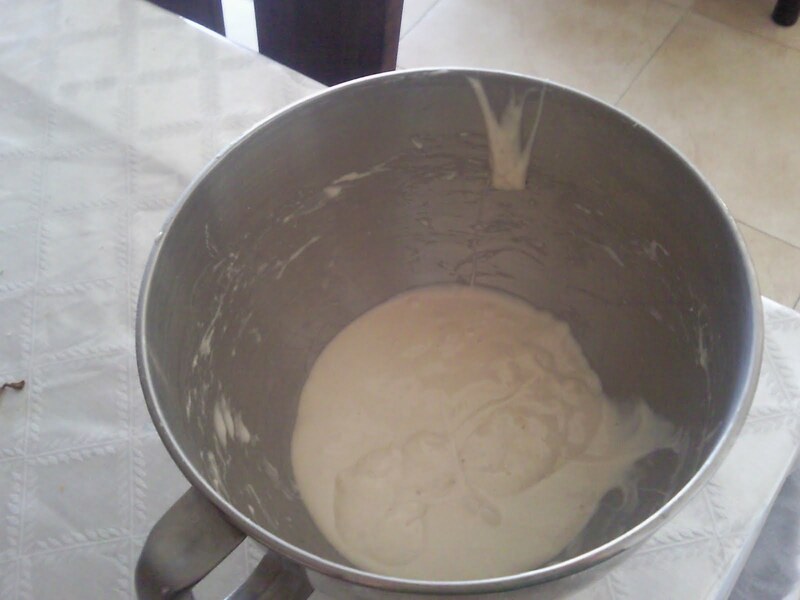 Mix for three minutes until completely combined and a batter forms. 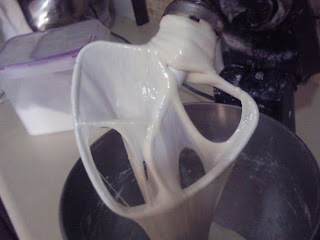 Raise the mixer to medium speed and beat for twenty minutes or until the dough cleans the sides of the bowl and forms a ball. Fear not- it will. Can you see that lovely gluten network that formed? Add the salt and the sugar and beat an additional two minutes. 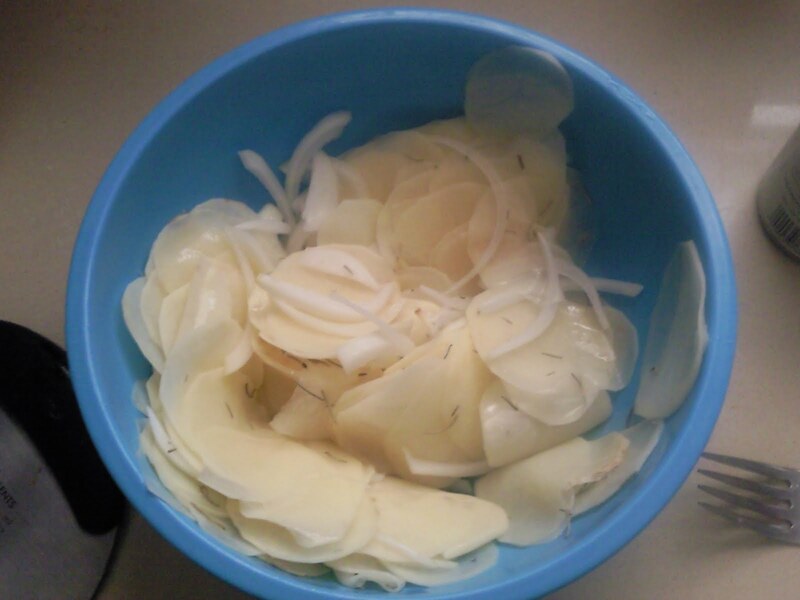 Allow to ferment for four hours or until puffy. 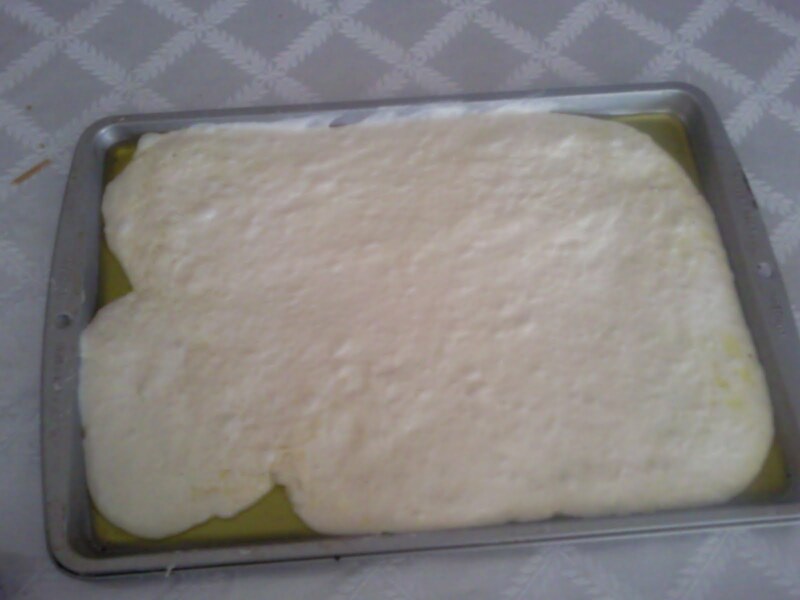 Pour the dough into a generously olive oil greased sheet pan. 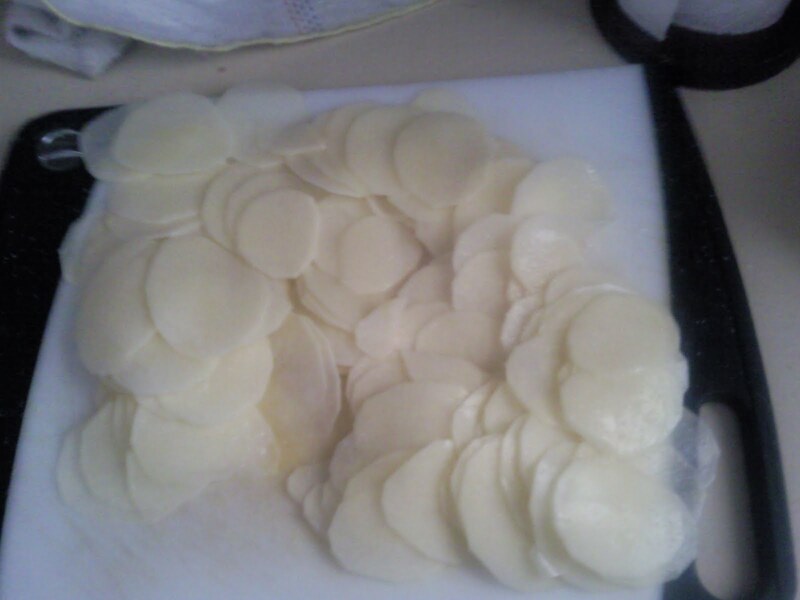 Spread as gently as you can to the edges, taking care not to pop any bubbles. If you are having difficulty, allow to rest at ten minute intervals as you need to stretch completely. While the dough is proofing, mandoline the potatoes and sprinkle with salt. Allow to sit for fifteen minutes. Squeeze out all of the liquid. Slice the onions while they're sitting. Combine the potatoes, onions, fresh or dried rosemary and salt. Preheat the oven to 450 degrees. Top the pizza by overlapping the potatoes onto the dough. Sprinkle on the onions. Drizzle with olive oil and sprinkle generously with salt. Bake for forty minutes, rotating halfway through. This is what it should look like. I removed the pizza from the rack to cool completely without soggying up the bottom. Serve hot or at room temperature. Mmmmmm. 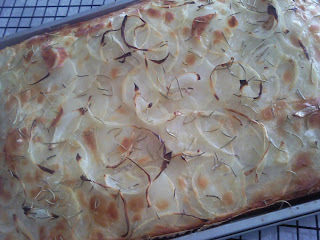 I've never tried potato pizza but yours makes me want to eat some soon.